Just like all our feelings, fear and anxiety is our natural inner response to something that is happening in our outer or inner environment. As such, it is helpful to understand its important role of giving us messages about something that seems dangerous to us in some way. 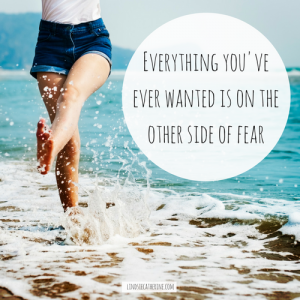 Instead of being afraid of our fear itself – and hence creating a vicious cycle – we need to listen to what our anxiety is trying to communicate us. What helps this deep inner listening, is to focus on the physical sensations that tells us that we are anxious. The nervousness in the belly, the quickening of our heartbeat and breathing, the clamminess of our skin, or any other sensation that we can notice. Observing inner sensations requires our right brain to activate, which is more able to “make sense” of the complex messages of our body. This means that when we are able to sit in this purely listening and observing role, eventually we will get new ideas bubble up from our right brain, which are those “light bulb” moments that we all love. We love it, because we just intuitively know in those moments, that our understanding has shifted about something important. When suddenly we realise something not just superficially, but we feel the truth of it in our deepest fibres. What tends to be in the way of this deep inner listening is our habit of paying attention to our thoughts only. Our left brain can generate thoughts thick and fast. We are taught mainly to rely on this kind of thinking for solving our problems. However, our left brain can simply just rack up all that we already know consciously about something and therefore can not move us forward, when some key piece of information is missing. Missing pieces of information can come externally. An example of the power of that is when we learn that being highly sensitive is a normal variation among people and not something that is “wrong with us”. For most highly sensitive people the new information about our trait will bring ripples of positive changes, as our whole understanding will readjust to fit with what we have learned. New information (ideas, realisations and creative thoughts) can also come internally. This is what our right brain can do for us and it helps to know how we can activate it. Turning our attention to our bodily sensation can do this, just as allowing yourself “just to be” and “day-dream”. This is very different from our tendency to “think hard” and wreck our brain for a solution. Our right brain generates thoughts at a slower pace, so getting these is a lot more about waiting for it to come than forcing it to happen. Artists would know that to get new ideas and inspiration, we need to be in a relaxed and open state to receive what comes. Luckily, we do not need to be artists to do this, just have to practice listening inward instead of getting lost in our thinking. This is why new ideas often come in the shower. When we learn to receive the messages our feelings communicate us with this kind of deep listening – we stop fighting with our process and with ourselves. For this to happen, we need to stop judging our feelings as good or bad. When we can see all of our feelings as messengers of information, we can stop becoming upset every time we feel anxious, angry or depressed. This stops the vicious downward cycle. This allows us simply to experience our feelings and let those deeper layers of “knowing” come up that can tell us about what stirred those feelings instead. You can hone your ability of listening to your feelings, with learning Focusing. In a few focusing lessons, you can learn this simple self-healing practice that teaches you to be with your inner experiences in a helpful way.